49 Hereford is located on the west side of Hereford, between Commonwealth and Newbury, with 47 Hereford to the north and 51 Hereford the south. 49 Hereford was designed by Bradlee and Winslow, architects, and built in 1882 by Vinal and Dodge, masons. It is one of five contiguous houses (45-47-49-51-53 Hereford) they built for speculative sale in association with building contractor George Wheatland, Jr. He is shown as the owner on the original building application for all five houses, dated February 24, 1882. 47-53 Hereford are designed as a symmetrical composition, somewhat unbalanced by 45 Hereford. Click here for an index to the deeds for 49 Hereford. On May 5, 1884, 49 Hereford was purchased from George Wheatland, Jr., by Annah L. (Brown) Wentworth, the wife of carpet merchant and manufacturer Frederick B. Wentworth. They previously had lived in Walpole. On July 10, 1885, 49 Hereford was acquired from Annah Wentworth by her brother, Samuel Newell Brown. 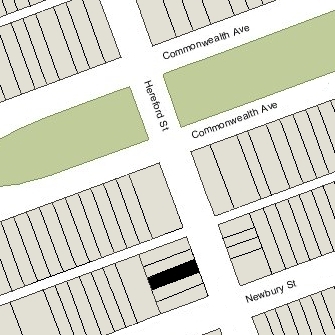 He and his wife, Ruth Coombs (Haskell) Brown, lived at 119 Commonwealth. Frederick and Annah Wentworth continued to live at 49 Hereford during the 1886-1887 winter season, but moved thereafter to Dorchester. On November 14, 1887, 49 Hereford was purchased from Samuel N. Brown by Annie Elizabeth (Everett) Maynard, the wife of stable-owner John E. Maynard. They previously had lived in Charlestown. John E. Maynard, Jr., his son by his previous marriage to Susan E. (Hawley) Maynard, lived with them. The Maynards continued to live at 49 Hereford during the 1888-1889 winter season, but moved thereafter to the Hotel Ilkley (Huntington at Cumberland). On May 10, 1899, 49 Hereford was purchased from the Maynards by Louisa Green (Bursley) Fessenden, the wife of Sewall Henry Fessenden. They previously had lived at 17 Hereford. They also maintained a home in Newton. Their unmarried son, Russell Green Fessenden, lived with them. Sewall Fessenden was agent for the Boston and Sandwich Glass Company. Russell Fessenden was a real estate dealer. Sewall Fessenden died in July of 1894. Louisa Fessenden and Russell Fessenden continued to live at 49 Hereford until her death in July of 1903. Russell Fessenden moved thereafter to 24 Marlborough. On October 23, 1903, 49 Hereford was purchased from the estate of Louisa Fessenden by Harriet Susanna (Woodworth) Sherman Hopkins, the wife of Dr. Samuel A. Hopkins, Jr., a dentist. They previously had lived at 235 Marlborough, where he continued to maintain his dental office. Nathaniel Woodworth (Sherman) Hopkins, Harriet Hopkins’s son by her previous marriage to Adelbert C. Sherman, lived with them. Harriet Hopkins died in April of 1907. Samuel Hopkins and Nathaniel Woodworth (Sherman) Hopkins continued to live at 49 Hereford during the 1907-1908 winter season, after which they moved to 235 Marlborough, where he had continued to maintain his dental office. In her will, Harriet Hopkins had left 49 Hereford to her son, Nathaniel, and on November 22, 1909, he transferred it to his step-father. During the 1908-1909 and 1909-1910 winter season, 49 Hereford was the home of George W. Harrington and his wife, Marion (Andrews) Harrington. They previously had lived at 59 Chestnut. He was a real estate dealer and later would also become a poet and author. During the 1910-1911 winter season, Samuel Hopkins was again living at 49 Hereford. He moved by back to 235 Marlborough by the next season. On September 1, 1911, 49 Hereford was acquired by Thomas Hunt, an attorney. He and his wife, Carrie (Speiden) Hunt, lived at 44 Mt. Vernon. He leased 49 Hereford to others. By the 1911-1912 winter season, it was the home of Arthur Wallace Rice and his wife, Martha Davis (Brewer) Rice. They previously had lived in Jamaica Plain. Arthur Rice was an architect. At the time he lived at 49 Hereford, his firm — Parker, Thomas, and Rice — was responsible for the design of the Harvard Club at 374 Commonwealth. The Rices continued to live at 49 Hereford in 1913, but had moved to Milton by 1914. 49 Hereford was not listed in the 1914-1917 Blue Books. By 1916, 49 Hereford was the home of Dr. James Murray Gallison and his wife, Mae (Kells) Gallison. He was a physician and surgeon, and also maintained his office there. They previously had lived (and he had maintained his office) at 407 Marlborough. They continued to live at 49 Hereford during the 1917-1918 winter season. By 1920, they had moved to Brookline and he had moved his office to 522 Commonwealth. On October 1, 1918, 49 Hereford was acquired from Thomas Hunt by real estate and insurance broker Walter Samuel Chapin. On the same day, he transferred the property to Albert Cameron Burrage. He and his wife, Alice Hathaway (Haskell) Burrage, lived at 314 Commonwealth. He was an attorney and former gas lighting company official, and was an investor in mining and chemical companies. He leased 49 Hereford to others. Albert Burrage died in June of 1931. However, the deed from Walter Chapin to Albert Burrage was not recorded until June 25, 1935, on the same day as Alice Burrage, as executor of his estate, transferred the property to herself as his heir. She continued to lease 49 Hereford to others. By the 1919-1920 winter season, 49 Hereford was the home of Gerald Dorr Boardman, a real estate dealer, and his wife, Elizabeth Elwood (Devens) Boardman. They previously had lived in Auburn, New York, where he had been business manager for the interests of Thomas Mott Osborne, a bank manager, and managing editor of the Auburn Publishing Company. They continued to live at 49 Hereford in 1926, but had moved to 387 Commonwealth by 1927. They also maintained a home in Manchester. By the 1926-1927 winter season, 49 Hereford was the home of Elizabeth (Devens) Boardman’s brother, Arthur Lithgow Devens, III, and his wife, Wenonah (Wetmore) Devens. They had lived at The Charlesgate at 535 Beacon during the previous season, and at 367 Beacon prior to that. They also maintained a home at Nahant. Arthur Devens was a banker and broker. 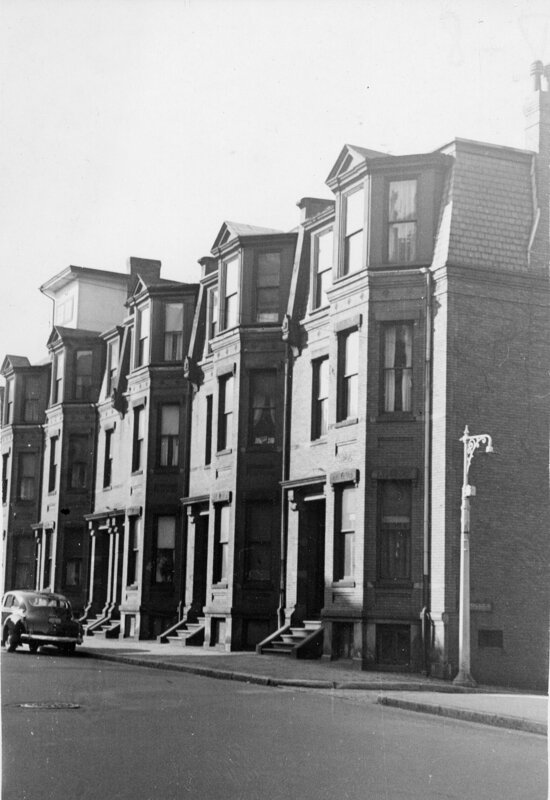 The Devenses continued to live at 49 Hereford until about 1940, when they moved to an apartment at 512 Beacon. By 1941, 49 Hereford was the home of Miss Susanna H. Moore, who operated it as a lodging house. 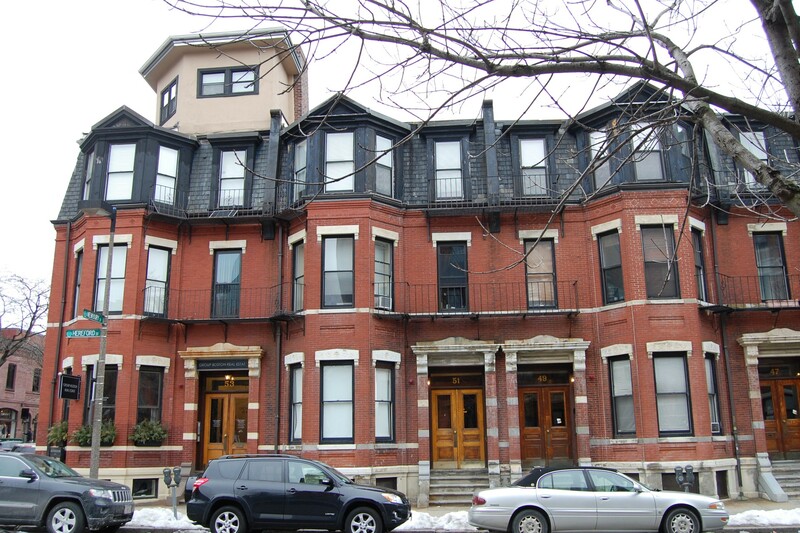 She previously had lived at 301 Newbury, where she had also operated a lodging house. She continued to live at 49 Hereford until 1942. By 1944, 49 Hereford had been leased from Alice Burrage by Phillip J. Arnold and his wife, Blanche Arnold, who operated it as a lodging house. They previously had lived in New York. They continued to live at 49 Hereford until mid-1945. On December 27, 1944, 49 Hereford was acquired from Alice Burrage (through Frederick E. Ordway, a real estate conveyancer) by Samuel Siskind, a lawyer. On March 29, 1945, it was acquired from Samuel Siskind by Ralph Charles Vinal. He and his wife, Mary Charlotte (Thompson) Vinal, previously had lived at 45 Westland. She died in November of 1943, and after acquiring 49 Hereford, he made it his home. It continued to be a lodging house. By mid-1945, 49 Hereford also was the home of Mrs. Susan Mabel (Brown) Elliott, the former wife of Burton Austin Elliott, who probably operated the lodging house. She also previously had lived at 45 Westland. On November 30, 1950, Susan Elliott acquired 49 Hereford from Ralph Vinal. He continued to live there until his death in September of 1954. Susan (Brown) Elliott married in about 1960 to Arthur D. Murphy. They moved soon thereafter. On October 25, 1961, 49 Hereford was purchased from Susan Murphy by William T. Stewart and his wife, Patricia (Spaulding) Stewart. They owned and lived at 47 Hereford and leased 49 Hereford to others. By 1962, 49 Hereford was the home of Estelle Morrelli who continued to operate it as a lodging house. She lived there until about 1967. On August 16, 1967, Dr. Rose (Wexler) Winston, a physician, acquired 47-49 Hereford from William and Patricia Stewart. She already owned 51–53 Hereford. 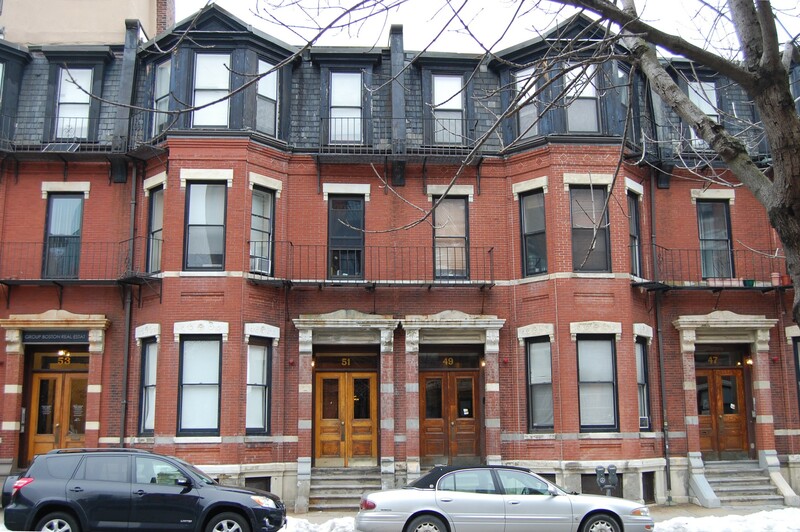 She and her husband, Dr. Murray R. Winston, also a physician, lived at 133 Commonwealth. She operated 47-49-51-53 Hereford as lodging houses. 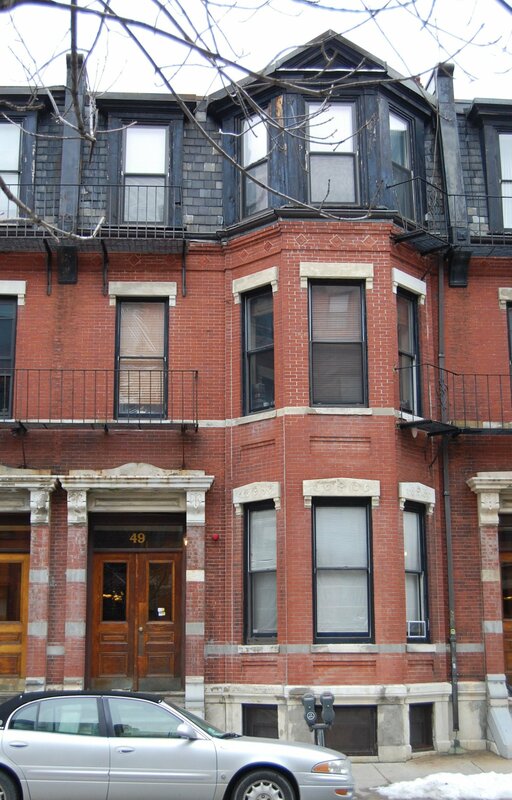 In August of 1992, Patrick Glynn filed for (and subsequently received) permission to convert 49 Hereford into seven apartments, which he indicated had been its actual status for a number of years. On December 22, 1994, 49 Hereford was acquired by the 49 Hereford Street Limited Partnership, the general partner of which was Countryside Management, Inc. (Patrick J. Glynn, treasurer, and his wife, Anne T. Glynn, president). On the same day, 47 and 51 Hereford also were acquired by parallel limited partnerships, and in August of 1995, 53 Hereford was acquired by another limited partnership of which Countryside Management was the general partner. In February of 1999, 45 Hereford was acquired by the 45 Hereford Street LLC (Neil G. Glynn, manager). 49 Hereford remained an apartment house in 2015.